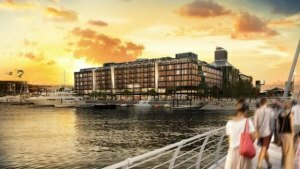 The hotel will embrace New Zealand culture in its design on the notion of a Maori cloak around the building, a double skin offering warmth, privacy and beauty. The seven storey hotel has a total floor area of 29,000 square meters, 195 rooms, food and beverage outlets, event spaces, a spa and a fitness centre that includes a 25m pool. The new hotel will be located on the former Team New Zealand site and completion is scheduled for late 2018.